Today's F Directors! entry focuses on the career of Academy Award-winning filmmaker Michael Cimino, who made one of the all-time classic Vietnam war epics and brought down United Artists before permanently disfiguring himself through plastic surgery. 1. 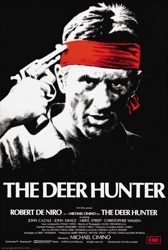 The Deer Hunter (1978) - Ok. We're good.